On the chart, I have marked two fractals (1 to 3). Both fractals exist in similar conditions – relative to the relevant Dow/Gold ratio peaks (1966 and 1999), as well as Dow peaks. Both fractals span over the period of the first phase of the silver bull market during the 70s and the current era (2001 to 2017), respectively. If the comparison is justified, then the US Dollar index will fall significantly during the coming months. 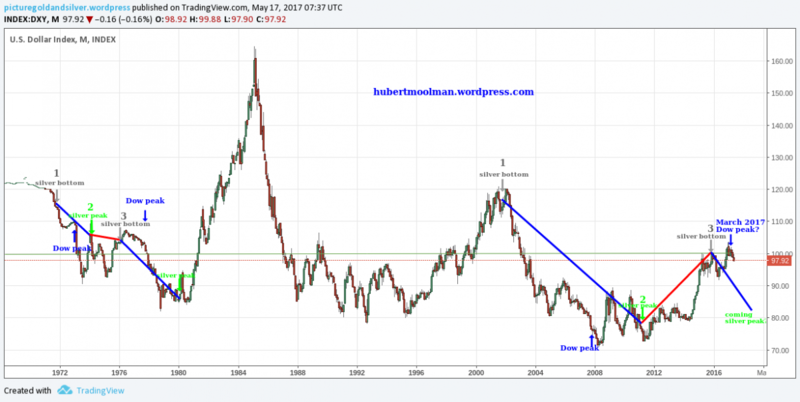 Given the fact that silver has traditionally had its strong rallies during times when the US Dollar Index was falling, this bodes well for a silver rally. However, it is important to note that a meaningful silver rally is dependent on whether the March 2017 peak is the actual peak for the Dow Index. If it is not, then we will have to wait longer.